The driving rhythm of commercial music is the Dabadaba rhythm. Why is Dabadaba the driving rhythm? Dabadaba is the driving rhythm because dabadaba makes you dance. Makes you rock. Makes you roll. When a someone hires me to teach them a tab they have sourced from the internet, virtually seven times out of ten, they want to learn a dabadaba tune. Dabadaba rhythms are like oxygen. What is the most driving music rhythm? What is the most driving drum rhythm? What is the most driving bass rhythm? What is the most driving vocal rhythm? What is the most driving guitar rhythm? What is the most driving melody rhythm? Trying to learn music without learning Dabadaba is like trying to write without an alphabet. Dabadaba has two meanings: a specific meaning and a general meaning. Dabadaba specifically is a sequence four Eighth note rhythms. Dabadaba generally is the vocabulary of 16 plus rhythms that derive from the specific dabadaba rhythm. As you learn them, you will know their two meanings like the back of your hand. 2. Watch this video. Several times. Download it if that makes repeat watching easier. 3. Download the Dabadaba rhythms pdf and keep it on your computer screen or print it off for handy reference. 4. Talk along with the video. Download the pdf version of the Dabadaba Rhythm Vocabulary here. The instructions you got before the video will get you started. If you only want a light introduction to the Dabadaba's then read no more and proceed to the dibidibi's. Want an in depth, lifetime, mastery of the dabadaba's?. 3. Play the video again twice. Focus on soundlessly mouthing the Dabadaba rhythms with the soundtrack. Focus on what your speech muscles (lips, tongue, jaw) are doing when you think each different sound. 4. Take a one minute break and let your subconscious integrate the information uncritically. 5. Play the video again twice. Focus on saying the Dabadaba vowels (e, u, o) with the correct vowel length with relaxed speech. This is critical. 6. Take a one minute break and let your subconscious integrate the information uncritically. 7. Play the video again twice. Focus on saying the Dabadaba consonants and vowels (e, u, o) with the correct vowel length with relaxed speech. This is critical. 8. Take a one minute break and let your subconscious integrate the information uncritically. 9. Play the video again twice. Focus on imitating clearly and correctly the Dabadaba words you hear. 10. Take a one minute break and let your subconscious integrate the information uncritically. 1. Look at bars 1-5 for one minute only on your your Dabadaba rhythm vocabulary pdf. Focus on the written words. Ignore the notation. Learn just the written words. 2. (If you have a metronome set it to MM60). Say these rhythms by memory with correct consonants and vowel length for one minute. 3. Take a one minute break and let your subconscious integrate the information uncritically. 4. Look at bars 6-11 for one minute only. Focus on the written words. Ignore the notation. Learn just the written words. 5. (If you have a metronome set it to MM60). Say these rhythms by memory with correct consonants and vowel length for one minute. 7. Look at bars 12-16 for one minute only. Focus on the written words. Ignore the notation. Learn just the written words. 8. (If you have a metronome set it to MM60). Say these rhythms by memory with correct consonants and vowel length for one minute. 9. Take a two minute break and let your subconscious integrate the information uncritically. 10. Without looking at the page, recall bars 1-11 for one minute only. At the end of this minute, take a one second look at the page to remind you of any bar you can not recall. 11. (If you have a metronome set it to MM60). Say these rhythms by memory with correct consonants and vowel length for one minute. 12. Without looking at the page, recall bars 5-16 for one minute only. At the end of this minute, take a one second look at the page to remind you of any bar you can not recall. 13. (If you have a metronome set it to MM60). Say these rhythms by memory with correct consonants and vowel length for one minute. 14. Without looking at the page, recall bars 1-16 for one minute only. At the end of this minute, take a one second look at the page to remind you of any bar you can not recall. 15. (If you have a metronome set it to MM60). Say these rhythms by memory with correct consonants and vowel length for one minute. 16. Take a two minute break and let your subconscious integrate the information uncritically. 17. (If you have a metronome set it to MM60). Say these rhythms by memory with correct consonants and vowel length for two minutes. Focus on mistake free performance. 18. Take a one minute break and let your subconscious integrate the information uncritically. 19. (If you have a metronome set it to MM60). Say these rhythms by memory with correct consonants and vowel length for two minutes. Focus on mistake free performance. 20. Take a one minute break and let your subconscious integrate the information uncritically. Now you teach your muscles to strum the Dabadaba's in the air off your guitar. 1. Say the 4 attack and 3 attack rhythms from memory slowly out of tempo. On each d-consonant make an exaggerated down strum in the air. On each b-consonant make an exaggerated up strum in the air. Ensure the correct direction is strummed for each consonant. 2. (If you have a metronome set it to MM60). Say these rhythms by memory with correct consonants and vowel length for two minutes and the correct strum direction. Don't leave the muscles on their own. Say (instruct) the muscles what to play and when. Focus on mistake free performance. 4. Say the 2 attack, 1 and 0 attack rhythms from memory slowly out of tempo. On each d-consonant make an exaggerated down strum in the air. On each b-consonant make an exaggerated up strum in the air. Ensure the correct direction is strummed for each consonant. 5. (If you have a metronome set it to MM60). Say these rhythms by memory with correct consonants and vowel length for two minutes and the correct strum direction. Don't leave the muscles on their own. Say (instruct) the muscles what to play and when. Focus on mistake free performance. 7. Say the all 16 Dabadaba rhythms from memory slowly out of tempo. On each d-consonant make an exaggerated down strum in the air. On each b-consonant make an exaggerated up strum in the air. Ensure the correct direction is strummed for each consonant. 8. (If you have a metronome set it to MM60). Say these rhythms by memory with correct consonants and vowel length for two minutes and the correct strum direction. Don't leave the muscles on their own. Say (instruct) the muscles what to play and when. Focus on mistake free performance. 9. Take a one minute break and let your subconscious integrate the information uncritically. 1. Say the 4 attack and 3 attack rhythms from memory slowly out of tempo. On each d-consonant make an exaggerated down strum across all six open guitar strings (no chord). On each b-consonant make an exaggerated up strum across the strings. Ensure the correct direction is strummed for the correct consonant. 2. (If you have a metronome set it to MM60). Say these rhythms by memory with correct consonants and vowel length for two minutes and play the correct strum direction. Don't leave the muscles on their own. Say (instruct) the muscles what to play and when. Focus on mistake free performance. 4. Say the 2 attack, 1 and 0 attack rhythms from memory slowly out of tempo. On each d-consonant make an exaggerated down strum across all six open guitar strings (no chord). On each b-consonant make an exaggerated up strum across the strings. Ensure the correct direction is strummed for the correct consonant. 7. Say the all 16 Dabadaba rhythms from memory slowly out of tempo. On each d-consonant make an exaggerated down strum across all six open guitar strings (no chord). On each b-consonant make an exaggerated up strum across the strings. Ensure the correct direction is strummed for the correct consonant. You have learnt to say and play the Dabadaba's at a mistake free tempo. You can now read all the Dabadaba songs on the market. And all the dabadaba parts of all songs in the world. Did you have that ability at the start of this page? Now that you know your Dabadaba's you need to strengthen your Dabadaba conversational ability and your Dabadaba reading ability. You might think there's a lot of easy Dabadaba readers out there right? Well, here is a system that consists of a Dabadaba workbook and three DVDs. The workbook consists of three sections. In section one you learn to talk Dabadaba's in all different combinations. No Dabadaba rhythm combination will phase you after that. In section two, you turn the tables. You turn Dabadaba words into music notes. Yeah! That's right! Guitarist you writes music. You'll be puffing out your chest when you look back on thirty pages of music that you wrote. In section three its just you and the music: no words. No Dabadaba's. Just you. And of course your unshakeable ability to read this stuff like a newspaper. We help you read the book too! With three Video Books you won't be left to figure the book out on your own. Each chapter in each DVD walks you through every page of the book. The guitar teacher is there talking every rhythm with you. No video exceeds seven minutes. You could do all nine lessons in one day. Or spread them over three. Your pace is your choice. Where do you get this Dabadaba System? Mmm. It's not available everywhere. Yet. 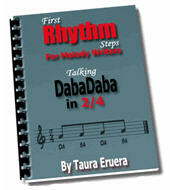 At the moment, the Dabadaba system, valued at USD $47, is available only to Rhythm members at www.melodywriters.com. A rhythm membership at Melodywriters.com may be worth considering if you have even a passing interest in playing convincing dabadaba guitar. Don't be put off by the fact that you see only Melodywriters and not Guitar players on the covers. That will change over time. What doesn't change over time are the rhythms that melody writers and melody players use (read guitar players). The Dabadaba's are exactly the same. For all musicians. We are looking to make this Dabadaba system available through other avenues. We're not sure when that will be. This sytem is available for $27 NZD to any guitar student of the guitar teacher. If they decide this is absolutely the first thing they want to study with their guitar lessons, then they get it for free. As a thank you for studying with the guitar teacher.